Designed for speed and comfort. The Vaypor S once again redefines the standards of pro level road cycling shoes. Our latest flagship shoe has been further refined to improve on our already industry leading standards. Wether you are a pro racer or simply a rider who demands the finest, the Vaypor S will provide the most anatomically and biomechanically correct platform with the most efficient power transfer platform currently available. Strength to weight ratio's have always played an important part in Bont cycling shoe design as all materials considered and developed for products within the Bont range must comply to strict standards. Durolite has been developed and chosen for the Vaypor S upper for its extremely durable nature and light weight. The Vaypor S is manufactured utilizing unidirectional carbon fibre laid specific to stress points to maximise performance whilst minimising weight, creating the highest strength to weight ratio of any cycling shoe currently available. The base is finished with a matt treatment to improve the aesthetics of the sole. 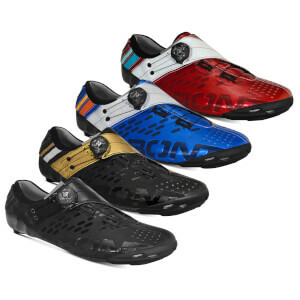 Bont Cycling’s Micro Grid allows for greater accuracy in cleat placement and adjustment. One of the key features of the Vaypor S is it’s new upper design and integrated retention system. Whilst designing the Vaypor S, it was imperative that the shoe would cater to the extremely demanding needs of professional sprinters. Pro sprinters require not only an extremely comfortable shoe with lossless power transfer, but also a highly adjustable retention system that is able to lock them into the heel cup of a shoe without any heel movement. Between the outer leather and the liner we add a material that is proprietary to Bont to stop the cycling shoe from stretching over time. This material has similar strength characteristics to Kevlar. The material is stitched to the outer leather and bonded to the liner so it can never move or be removed, it becomes part of the cycling shoes structure. This layer assits in pedalling efficiency by maintaining a supportive structure over the top of the foot in the upward part of the pedal stroke. A last is a replica of a foot that the cycling shoe is built around. Last makers do not make cycling shoe lasts, they only make shoe lasts so perfecting a cycling shoe last requires a great deal of expertise in functional biomechanics and ongoing research. At Bont, we have been perfecting our performance footwear lasts since 1975 and the process is ongoing. We believe we place more importance and thus place more effort into our last than any other cycling shoe brand and it is the reason that Bont cycling shoes continue to be a leader in providing the most functional and correct anatomical support to cyclists than any other brand on the market. 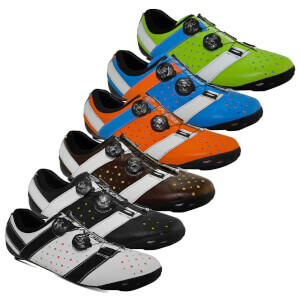 Our motto in terms of cycling shoe fit is simple, ""We make shoes for cycling, not walking."" Bont carbon fiber is sourced exclusively from the world's #1 carbon manufacturer, Toray of Japan. The base of the Vaypor S is made by hand utilizing uni-directional carbon fiber which is embedded with epoxy thermo setting resin. The fibers are hand laid in the matrix according to the strain they will have to bear. The Vaypor S utilizes unidirectional carbon fiber allowing Bont to create a performance cycling shoe with very specific strength characteristics based on stress points in cycling. As unidirectional carbon absorbs less resin then cross weave fibers, it also assists in the weight reduction of the cycling shoes. Structural medial longitudinal arch support is provided in all models to stop over pronation of feet. Over pronation is one of the main contributors to incorrect tracking of knees during a cyclists pedaling phase due to internal rotation of tibia and femur. This can result in knee injuries. In addition, the rotation of tibia/femur can cause the pelvis to tilt resulting in lower back strain. Conventional cycling shoes offer a “dress shoe” type shaping. Although highly aesthetic this will cause the toes along with the metatarsals to be overly constricted, compressing the nerves between the metatarsals which often results in the common ""hot foot"" sensation. The anatomical heel cup shaping of Bont cycling shoes provides increased stability during the pull through stage of pedaling stroke and up stroke. This stabilization is achieved without any mechanical operation or over tightening of straps/laces allowing for increased comfort and blood circulation. Bont’s lateral forefoot support ensures neutral positioning of the forefoot and alleviates common issues associated with over pronation and supination. These issues often result in incorrect tracking of knees causing injuries along with hip and lower back pain.